Day trips are always wonderful things for just about anyone – including pups! And it is easy to see why – you get to go somewhere else for a while and enjoy the sights and sounds of some foreign place. For some reason, those experiences are always a whole lot more fun than the ones you can get from the comfort of your own house! It is no exception for this German Shepherd pup and his friend. His parent doesn’t bring him to the lake all the time, but trips are often enough that it has become somewhat routine for him Still, that hasn’t made his excitement and love for swimming in this lake fade one bit! 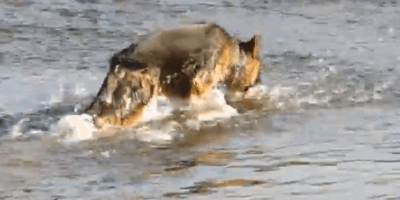 You can see these two pups are having an absolute blast just splashing around in the water and exploring its shores. You can never know what treasures you may find along these shores, after all!